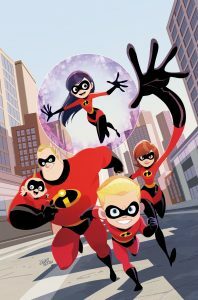 With the highly-anticipated release of Disney Pixar’s Incredibles 2 quickly approaching, Dark Horse is excited to return to the adventures of the Parr family and announce some incredible new content: a graphic novel for younger readers and a three-issue comic series based on the new film! Disney Pixar’s Incredibles 2: Heroes at Home graphic novel for younger readers will go on sale on June 12, 2018. The first issue of Disney Pixar’s Incredibles 2: Crisis in Mid-Life! & Other Stories goes on sale July 11, 2018. Disney Pixar’s Incredibles 2: Heroes at Home finds Dash and Violet doing their best to help out at home while their mom and dad—Mr. and Mrs. Incredible—take on new and very different jobs. First, Dash and Violet must secretly go into Super mode when they interrupt criminal activity on a routine grocery trip to pick up some essentials! Then, helping out at home, their efforts to keep up with their chores are unknowingly obstructed by the innocent mischief of their little brother, Jack-Jack! Writer Liz Marsham (Disney Princess Beginnings) pens this graphic novel while artist Nicoletta Baldari (Star Wars Adventures: Forces of Destiny) brings her illustrative skills to the Parr family’s latest crime-stopping mission. Disney Pixar’s Incredibles 2: Heroes at Home features stories that are accessible to young readers—but enjoyable for everyone! In these two tales featuring story elements from the film, Violet, Dash, and Jack-Jack must balance their everyday lives with being secret Supers. Disney Pixar’s Incredibles 2: Crisis in Mid-Life! & Other Stories #1 contains part 1 of “Crisis in Mid-Life!,” part 1 of “Bedtime Story,” and a standalone Jack-Jack story. While dedicating a new submarine, Mr. Incredible is interrupted by the dastardly Bomb Voyage—who is intent on crushing the crowd of onlookers underneath the sub! Mr. Incredible struggles to save the day, which has him questioning his super powers—could something be wrong? In “Bedtime Story” part 1, Bob tells Jack-Jack a bedtime story that has Violet and Dash calling foul: this battle from his glory days seems too amazing to be true. Then in his own adventure, at a visit to the park, Jack-Jack uses his powers to overcome a worthy opponent! 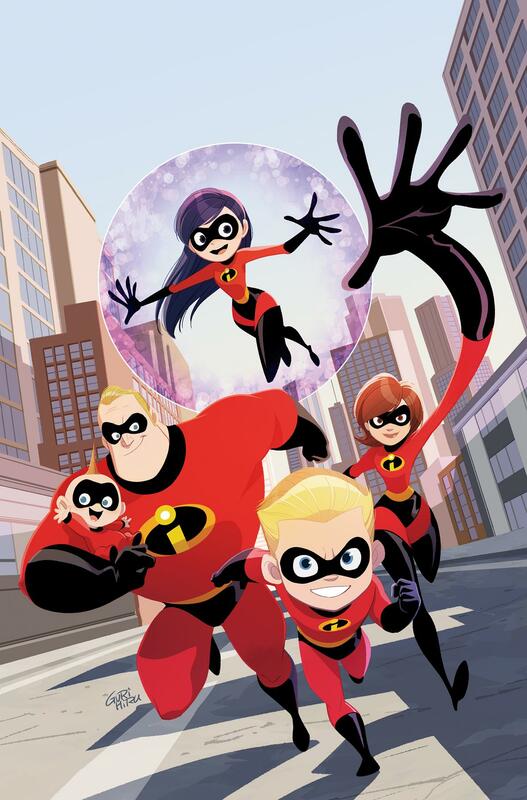 The adventures of the Parr family—AKA, The Incredibles—continue in this super comics collection, written by Christos Gage, and Landry Q. Walker, and illustrated by Gurihiru, J.Bone, and Andrea Greppi and Roberta Zanotta. Every issue in the three-issue miniseries will feature two original ongoing stories, plus Jack-Jack focused shorts in issues #1 and #2, set during and after the events of Disney Pixar’s Incredibles 2. Disney Pixar’s Incredibles 2: Heroes at Home is available for preorder on Amazon and TFAW, and at your local comic shop. This 48-page graphic novel retails for $7.99. Disney Pixar’s Incredibles 2: Crisis in Mid-Life! & Other Stories #1 is available for preorder at your local comic shop.